Just a quick note to let you know I made it across the ocean and the government even let me back into the country! My first thoughts: I can't believe how big everything is here! Everything seems a bit surreal right now, but I'm sure it will all come make sense to me eventually. I'm setting about doing research on getting new health insurance, a cell phone, and a new computer...so if anyone has any advice (or knows anyone who'd benefit from setting me up with any of these), please let me know! Well, this is the last post I'm doing from Japan...thank you all for following my adventures here, and see you in the U.S.! Even though the weather's been messy here in Tokyo, the Ghibli Museum was the perfect rainy day activity. WOW! What a fantastic museum. Can you see Totoro in the window there? I'm in Tokyo now, and heading to Fuji after I visit the Ghibli Museum in Mitaka. Hope to be able to send you a view of Fujisanlater! I'm amused by the song they're using - sounds just like "Dinah (won't you blow your horn?)" Though weather conditions were not ideal, we still got glimpses of the celestial event the other day. For some reason, my keitai (phone) is now saving my photos in a way that doesn't let me edit/rotate them. I have no idea why this was saved sideways, but, oh, well! 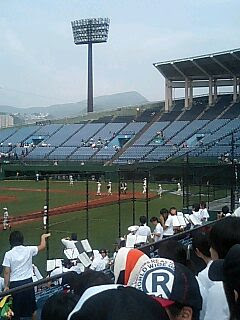 This is from the baseball game the other day. Unfortunately, our team lost, but we all were quite impressed with the solar eclipse that coincided with the game. It made things a bit cooler in the stadium. :) On the way to the stadium, I was teaching kids the "Take me out to the ball game" song, but we didn't have a chance to use it during the game, since they had so many other cheers! These kids do an aMAZing job of cheering for each other! Every time our team was up, so was the entire school - on their feet, doing some kind of cheer. It was pretty exhausting, but so much fun! I'm cleaning out my desk, and just found one of my notes about a recent student assignment where students described their favorite teacher (I was the example, so they couldn't choose me :) ). When I was checking their "scripts" these two gems cracked me up! Wow! 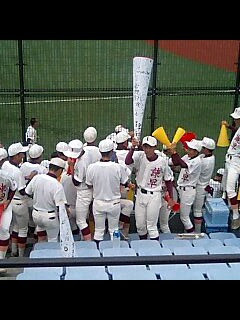 Our baseball team is playing in a championship game in Nagasaki, and the whole school is here to cheer them on!